When our skin feels good, we feel good, but everyday factors including pollution, lifestyle and diet can affect skin in many ways. Perfectil Plus Skin is a patent protected formula with nutrients for even greater support for your skin†. 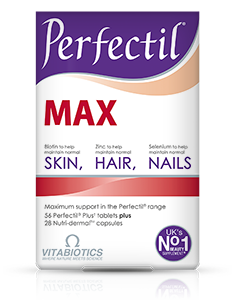 Perfectil Plus Skin provides the original effective Perfectil formula for skin, hair and nails, plus the additional benefit of a specialist Nutri-dermal™ capsule, in a dual pack. Each Nutri-dermal™ capsule provides extra specific nutrients targeted at skin health. Our skin, hair and nails all require specific vitamins and nutrients. 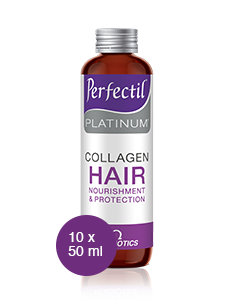 Perfectil works by delivering nourishment through the bloodstream, so works 'from within'. Each original tablet contains a range of over 20 micronutrients with specific ingredients for skin, hair and nails. Perfectil Plus Skin is available in the UK from Boots, supermarkets and pharmacies, health stores including Holland & Barrett. Alternatively order online here. Maltodextrin, Bulking Agents: Microcrystalline Cellulose & Calcium Hydrogen Phosphate Dihydrate, Magnesium Oxide, Vitamin C (Ascorbic Acid [Carriers: Hydroxypropylmethylcellulose & Tartaric Acid]), Pantothenic Acid (as Calcium Salt), Vitamin E (as D-Alpha Tocopheryl Acid Succinate) (from Soya), Tablet Coating (Natural Source Colours [Titanium Dioxide, Iron Oxides], Hydroxypropylmethylcellulose, Hydroxypropylcellulose, Microcrystalline Cellulose, Stearic Acid, Caprilic/Capric Triglycerides), Zinc Sulphate, Ferrous Fumarate, Anti-Caking Agents: Stearic Acid, Silicon Dioxide & Magnesium Stearate, Niacin (Nicotinamide), L-Cysteine, Vitamin B6 (Pyridoxine HCl), Grape Seed Extract, Thiamin (Vitamin B1 as Mononitrate), Vitamin B12 (Cyanocobalamin [Carriers: Trisodium Citrate, Citric Acid, Maltodextrin]), Betacarotene (Carriers: Starch, Water, Antioxidant: DL-Alpha Tocopherol), Crosslinked Cellulose Gum, Riboflavin (Vitamin B2), Vitamin D3 (Cholecalciferol [Carriers: Acacia, Sucrose, Corn Starch, Medium Chain Triglycerides, Antioxidant: DL-Alpha Tocopherol]), Copper Sulphate, Manganese Sulphate, Folic Acid (as Pteroylmonoglutamic Acid), Chromium Trichloride, Potassium Iodide, Sodium Selenate, Biotin. Allergy Advice: For allergens see ingredients in bold. Omega-3 Fish Oil (from Fish), Capsule Shell (Pharmaceutical Grade Gelatin [Halal Bovine Source], Glycerin, Natural Lemon Flavouring & Natural Source Colour [Red Iron Oxide]), Starflower Oil, Blackcurrant Seed Oil, Lutein Esters (Lutein, Sunflower Oil, Antioxidant: Natural Tocopherol), Lycopene Extract, Co-Enzyme Q10, Biotin. Allergy Advice: For allergens, see ingredients in bold. As with other food supplements, , consult your doctor of pharmacist before using if you are under medical supervision, pregnant, breast-feeding, have epilepsy, a thyrpid condition, haemochromatosis, or suffer from food allergies or are allergic to any of the ingredients. Made in a site that may handle nuts. 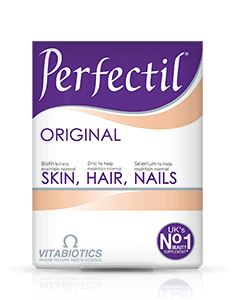 Not suitable for children. .
Why has Perfectil Plus Skin been developed? How does Perfectil Plus Skin differ from Perfectil Original? Who should use Perfectil Plus Skin? Can Perfectil Plus Skin be used during pregnancy and breast-feeding? Can Perfectil Plus Skin be taken simultaneously with medicines? 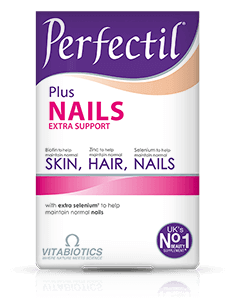 How many tablets does one pack of Perfectil Plus Skin contain? How and when should Perfectil Plus Skin be used? 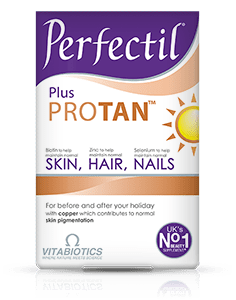 What happens if I forget to take my Perfectil Plus Skin and miss a day? Are there any undesired effects whilst taking Perfectil Plus Skin? 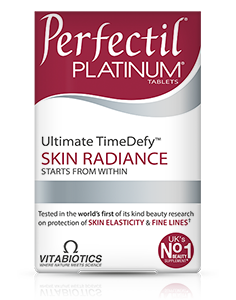 Is Perfectil Plus Skin recommended with any other Vitabiotics product(s)? Is Perfectil Plus Skin suitable for vegetarians? Always see pack before use for full information and directions. As with other supplements, seek professional advice before using if you are under medical supervision, pregnant, breast-feeding, suffer from food allergies, or are allergic to soya, fish or fish products. This product contains iron, which if taken in excess, may be harmful to very young children. Vitamin supplements are not intended to treat or prevent any disease. Food supplements must not replace a varied and balanced diet and a healthy lifestyle.